We need to read all of these sins God tells us not to commit and truly desire–work hard–to obey God. “Those who love me will keep [obey] My Word” (John 14:23). Committing any of these sins leads to a life of despair. While a life free from sin delivers a life and eternity of great joy. This is only a partial list as the entire Bible is our direction as what to do and not to do. We need to read all of the Word if we truly believe in God and desire to live His commands while possessing real sorrow for our failures through confession. Understanding the difference in between mortal and venial sin can be confusing and much of the time. We will never know for sure since only God, who reads the mind and probes the heart, can honestly know our intentions. But those who truly love God don’t desire to sin at all, so spending ones time trying to figure what sins to commit and not to commit isn’t profitable. Desire to remove all of them by simply working to remove the most serious sins we are aware of first and work our way to perfection. Perfect contrition (perfect sorrow) for one’s sins is needed for eternal life since we can’t love anything above God..not even being more concerned about our eternal demise…or we commit idolatry. Therefore spend most of our time trying to increase our love for God so we can loose our desire for everything else. But to understand which sins we want to work on first, so we can see what sins destroy the free gift of saving grace (salvation) we received at baptism–for it to be mortal–the sin someone chooses to commit must be seriously grievous. For instance: If someone becomes angry at another driver and calls him a name for cutting him off in traffic, that can be either a venial or mortal sin since the Bible says, “everyone who hates [has great anger towards] his brother [anyone] is a murderer, and you know that no murderer has eternal life remaining in him.(cf. 1 John 1:9). Now, does that mean every act of anger is equal to murder in the eyes of the Lord? No, especially if that anger was a one time act of impatience and there is real sorrow for the sin…but remember Christ dwells within everyone so when we are angry with someone for their failures (angry at the person, not the sin), we are displaying our unforgiveness, pride, impatience, and lack of love for Christ in our neighbor (others). We also know when someone is filled with much of God’s grace and is on the path of Life, they will have enough of grace to not behave so unloving with little tolerance for another’s imperfections. Making that burst of anger proof of our lack of grace. However, that act of anger (which is most likely a venial sin) is most likely a sign that someone isn’t in the state of grace, brought upon by either their ancestor’s sins (sinful dispositions we are born with or wrongful up bring causing spiritual blindness), bad example of others which were followed, or our own poor choices, especially if anger occurs regularly as a part of one’s repeated behavior. That anger is most likely a sign that someone has fallen outside of grace from another unrepented or unchanged (repeated) sin…a mortal act or acts resulting in the lack of love (anger) as a consequence from a great lack of grace in which they might be blinded too. And for course if someone sees no wrong in becoming angry, has no desire to stop, then most certainly that anger is mortal as we must resolve to sin no more to have forgiveness. Anger being serious is especially certain since the Word (Bible) says, “If anyone thinks he is religious [has saving grace] and does not bridle his tongue [can’t control his anger from a lack of grace] but deceives his heart [yet thinks he is holy because he knows God, does holy things or wants to be holy], his religion [thoughts of holiness/salvation] is vain [a lie]” (James 1:26). What a wonderful warning from James 1:26. He told us this so we would be vigilant and honest with ourselves to really look into ourselves for true knowledge of our good and bad actions so we can have the hope to change–repent. It is our loving or unloving actions that give us clues as to our state of grace. Looking carefully into our actions can help to determine if the faith we think we have is really true since a truly blessed (in the state of grace) faith produces consistent acts of love not anger. A lot of the time the faith we hope for or presume we have is still a developing faith that still hasn’t reached the point of not loving our sins. A true hate of our sins and a real working effort to consistently progress towards sinning no more–desire to become a saint–isn’t easy to obtain. Remember we don’t have to stop sinning to be saved, we just have to sincerely desire to sin no more through a real hate for our sins. St. Theresa of Avila says, everyone who is willing to die rather than cause another offense [even the slightest sin] against God can say that he truly hates his sins and is ready to die [finally possess contrition in order to be saved]. Our anger is a warning that there are real problems in our life…like unforgiveness, unwillingness to suffer, pride, etc…that need to be addressed (changed) before our hour comes or we might be walking blindly, thinking we are holy, from our sins, right into hell. “It is certain that few are saved” (St. Augustine). So don’t over look those frustrations; find out why we are frustrated and lacking grace to respond with love. Then repent of our selfish ways and change. Also, if someone is consistently angry at drivers and finds no harm thinking the poor drivers somehow deserve their chastisement for their stupidity in their driving, then from not being sorry for that anger from a lack of hating their sin, what was once a venial sin is now mortal from not caring to stop offending their God which opposes any contrition (sorrow) making them perfectly fine with scourging their Lord through their idolatry–love of that sin. God’s mercy (grace) is waiting for those who desire to rid their life of their sins in the sacrament of reconciliation. “If we acknowledge our sins [with honesty and humility], he is faithful and just and will forgive our sins and cleanse us from every wrongdoing” (1 John 1:9). Learn how to examine your conscience and remove the sin that is killing you for a life and eternity of Great Joy. Mortal sins, are the serious sins like the ones listed in the Bible stating “those who do such things [any of these things] will NOT inherit the kingdom of God”(Galatians 5:19). If someone continues to commit any mortal sin and never repents with actual sorrow before a priest nor possess perfect contrition before death, sadly, they will not be in heaven for all eternity because they rejected God for their sin. We must work hard to sin no more, God wants us in heaven. We must encourage those we really love to truly hate their sins and develop a real sorrow for them. Call upon His mercy, in the sacrament of reconciliation and in the other means He sends grace (prayer, Mass, works of mercy, etc. ), and He will give you the grace you need to rid the sins that will cause you to suffer forever without God’s love. Grave Matter: Must be a serious sin. Full Knowledge: Must know it is wrong either from the knowledge of right from wrong God places within us at creation (natural law) or from knowledge of the laws of the land or from God not placed within us from our creation (specific laws). Deliberate Consent: Must choose to commit the act or plan to do it. Nobody can accidentally or force you to commit a mortal sin. Mortal sins are the sins we commit that keep us from a life and eternity of great joy. They destroy our possibility for salvation and a life of true joy and peace with Jesus free from all despair. It is imperative that we know them. Mortal sin is serious sin that removes saving grace from one’s soul, which is the sanctifying grace received at baptism, as a free gift from God, for the forgiveness of sins, making someone without that grace undeserving of eternal life. In essence, when someone chooses to commit a mortal sin, and doesn’t confess that sins with a hate for that sin and doesn’t desire to never commit that sin again (in other words, does not repent with actual sorrow), that person has chosen their sin over God making them deserving of Hell, since mortal sin pushes out God’s sanctifying grace—the grace needed to be saved. Praise God since saving grace can be restored through the sacrament of reconciliation when one confesses their mortal sins to a priest with true sorrow (hates all of their sins and works hard to sin no more CCC #1451). The sacrament of reconciliation is the only ordinary means which restores that grace, and when the penitent (the person confessing) is heartily sorry for all their known mortal sins, the sacrament will also restore grace to their soul for any mortal sins that individual is blinded to as well. If you see your brother or sister committing what is not a mortal sin [venial sin], you will ask [pray], and God will give life [forgive] to such a one—to those whose sin is not mortal. There is sin that is mortal; I do not say that you should pray about that [but ask your brother or sister to confess to a priest for forgiveness to be given from God]. (1 John 5:16). 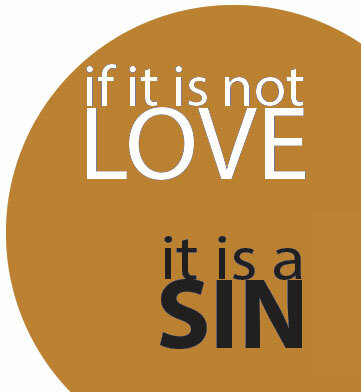 For a sin to be considered mortal, one must choose to commit it and know the sin is of a serious nature. For most sins (not manmade rules or “specific” laws from God), the basic knowledge or right and wrong—as well as the severity of the sin—has been instilled into the consciences of man upon creation. We know this because of the punishments God inflicted upon His children for their sins prior to the law of Moses—such as Noah and the flood, Sodom and Gomorrah, etc. People who committed mortal sin were punished eternally in the unquenchable fires of Hell even before God gave man the Ten Commandments or any other laws. “They [the Gentiles, who didn’t have the Law] show what the law requires [for salvation] is written on their hearts, to which their own conscience also bears witness [to the knowledge of the mortal sins which separate them from God and what is needed to repent]” (Romans 2:15). No one is deemed to be ignorant of the principles of the moral law, which are written in the conscience of every man (Catechism of the Catholic Church, #1860). Sin itself is spiritually blinding, in some cases causing us to not even recognize our mortal sins. Someone’s own sin or sinful thoughts, words and deeds (actions) one chooses due to a wrongful up bring (ancestral sins) and/or poor examples from their neighbors, makes them believe certain sins are okay when they aren’t. People are committing some of the most grievous offenses against God without even realizing it, but that doesn’t eliminate their guilt. Mortal sins—if not forgiven through the sacrament of confession before death—makes the unrepentant sinner deserving of the punishment of eternal fire, and creates a life of despair for that individual as they’ve separated themselves from God. If we truly desire to demonstrate our love for God, by working hard to not offend Him and becoming aware of our offenses by a daily examination of our conscience, then His mercy which waits for our truly repentant hearts will pour grace upon grace into the souls who trust in Him to show them the way to a life and eternity of true joy and peace—the kind only God can give—by allowing Him to help us rid our lives of mortal sin which only brings about misery. I am warning you, as I warned you before: those who do such things [any of these things] will NOT inherit the kingdom of God (Galatians 5:19). God wants us to spend eternity with Him in heaven. We must repent and repentance=change. Work hard to sin no more.